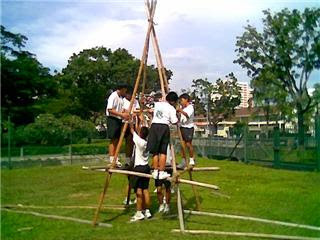 Last Friday 23 May 08, I walked passed St Patrick's School on the Marine Parade Road side and saw a group of boy scouts climbing onto a rope bridge anchor. It's the same type of bridge anchor that we built during our pioneer camp at Bedok. 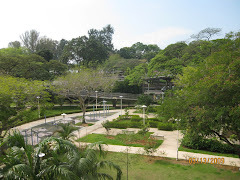 I could not help going into the school compound to snap the above picture. Intitially, I was stopped by the leader. But, after my explanantion that I was a scout before and the bridge anchor brought me fond memory, he allowed me to do so. As in the photo, the boys were still tying the knots to the upper part of the anchor. I passed St Patrick School very often and hope to see more scout activities from the boy scouts.